Sharjah – 2 October 2018: His Highness Sheikh Abdullah bin Salem bin Sultan Al Qasimi, Deputy Ruler of Sharjah and Deputy Chairman of the Executive Council, inaugurated the 45th edition of the MidEast Watch and Jewellery Show today (on Tuesday) at Expo Centre Sharjah. The MidEast Watch and Jewellery Show is organized under the patronage of His Highness Dr Sheikh Sultan bin Mohammed Al Qasimi, Supreme Council Member and Ruler of Sharjah. His Highness Sheikh Abdullah bin Salem bin Sultan Al Qasimi, Deputy Ruler of Sharjah and Deputy Chairman of the Executive Council, who was accompanied by Sheikh Mohammed bin Humaid Al Qasimi , Director of Sharjah Department of Statistics and Community Development (DSCD),HE Abdallah Sultan Al Owais, Chairman of the Sharjah Chamber of Commerce and Industry, toured the exhibition, which included the participation of more than 500 local and international companies and brands from 25 different countries that specialize in the design and manufacture of watches and jewellery, as well as accessories and ornaments made with gold, diamonds, precious stones, pearls and others. His Highness Sheikh Abdullah bin Salem bin Sultan Al Qasimi reviewed the exhibits of the Japanese jewellery companies, who are participating as part of a Japanese national pavilion for the first time in the exhibition. He then viewed the Indian pavilion, which is the largest at this year's show, as well as the Hong Kong, Italian, Malaysian, Singaporean, Lebanese and Thai pavilions. He also viewed the exhibits of some of the most prominent brands and companies that specialize in watches and jewellery from the United Kingdom, Russia, the United States, Latvia, Lithuania, Saudi Arabia, Jordan, Bahrain, and Taiwan, in addition to the exhibit of Malabar Gold and Diamonds, which participates in the exhibition for the first time. His Highness Sheikh Abdullah bin Salem bin Sultan Al Qasimi visited the exhibit of Salem Al Shuebi Jewellery, the Platinum Sponsor of the show. He then visited the platform of Emirati companies, which included a number of Emirati designers who showcased their latest collections of jewellery, gold, diamonds and precious stones among others. The Emirati designers are supported by the Sharjah Chamber of Commerce and industry, as part of its continuous efforts to champion and promote projects of young men and women. His Highness Sheikh Abdullah bin Salem bin Sultan Al Qasimi praised the success of Expo Centre Sharjah in attracting a variety of national pavilions and new exhibitors that are global leaders in the manufacture and design of watches and jewellery, who recognized the importance of this exhibition as a regional platform that can help them expand their presence in the Middle East and North Africa markets. He also commended the efforts of both the Sharjah Chamber of Commerce and Industry and Expo Centre Sharjah in enhancing the status of the exhibition, which is held under the patronage of His Highness Dr Sheikh Sultan bin Mohammed Al Qasimi, Supreme Council Member and Ruler of Sharjah. 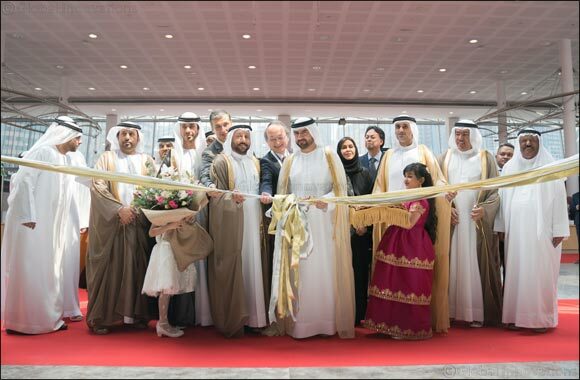 The opening ceremony of the exhibition was attended by HE Abdallah Sultan Al Owais, Chairman of the SCCI; His Highness Sheikh Abdullah bin Salem bin Sultan Al Qasimi, Deputy Ruler of Sharjah and Deputy Chairman of the Executive Council; and a number of board members of the chamber and the centre. The ceremony was also attended by HE Saif Mohammed Al Midfa, CEO of Expo Centre Sharjah; HE Mohamed Ahmed Amin, Acting Director-General of the SCCI; and a number of government officials, retailers and representatives of the gold and jewellery sector in Sharjah and the UAE. HE Abdallah Sultan Al Owais, Chairman of the SCCI, stressed the chamber's keenness to support and enhance the activities of the exhibition, which is organized and hosted by Expo Centre Sharjah, as part of the chamber's efforts to develop the economic sectors in Sharjah, such as the gold and jewellery sector. Al Owais pointed out that the exhibitions sector is one of the most important industries that promotes investment in Sharjah and enhances the emirate's status as an economic and cultural centre at the regional and global level, especially in light of the wise economic vision of His Highness Dr Sheikh Sultan bin Mohammed Al Qasimi, Supreme Council Member and Ruler of Sharjah. HE Saif Mohammed Al Midfa, CEO of Expo Centre Sharjah, stated that the exhibition satisfies a wide variety of tastes and preferences for lovers of traditional and modern watches and jewellery, in addition to offering visitors the chance to win valuable prizes with every purchase that is worth Dh500 and above. Al Midfa stated that he expects the new edition of the exhibition to achieve positive results for the exhibitors and retailers of watches and jewellery, and that the exhibition will witness an increasing number of visitors, especially in light of the 8% growth in the number of visitors witnessed during the previous edition of the show, which managed to attract 61,465 visitors. He remarked that the exhibition comes at a time when market studies indicate that the UAE has succeeded during the last few years in becoming the leading global hub in the diamond trade, with a volume of trade worth USD 26 billion, which makes it the largest diamond market globally. He added that the country has also been able to attract 14% of the global gold trade, which has increased its competitiveness in the gold industry and enhanced its status on the global gold trade map. The 45th edition of the show, which occupies an area of 30,000 square meter, will be held at a time when Gold and semi-processed gold now ranks as the number one imported goods in the country, where it has reached 10% of total annual imports, with a total value of Dh96 billion. The exhibition offers visitors the opportunity to buy directly from manufacturers. The exhibition also offers many opportunities to win valuable prizes and enter draws for every purchase of Dh500 and above, under the supervision of the Sharjah Chamber of Commerce and Industry (SCCI). The first day of the exhibition includes a draw for a jewellery set made of gold and diamonds, while the second day includes a draw for a Diamond ring. The third and fourth day include a draw for two diamond jewellery sets, while the final day of the exhibition includes a big draw for a 1-kilogram Gold Bar. The current edition of the show witnesses the first Japanese participation in the exhibition's 24-year history. This participation in the exhibition is in the form of a Japanese national pavilion, which includes a number of Japanese companies that are considered leaders in the watch and jewellery industry. The Indian pavilion is the largest at this year's show and includes 58 companies that are showcasing their latest modern and traditional jewellery designs. The Hong Kong pavilion is the second largest in terms of number of exhibitors and includes 55 companies and brands that are participating in this year's event. Other prominent national pavilions in the exhibition are the Italian pavilion with 30 exhibitors, the Lebanese pavilion with 28 exhibitors, the Turkish and Thai pavilions with 12 exhibitors each, and the Singaporean pavilion with 10 exhibitors. The show, which offers free admission for all visitors, opens its doors on Tuesday, Wednesday and Saturday from 12 pm to 10 pm. The exhibition will also be open from 12 pm to 11 pm on Thursday, and from 3 pm to 11 pm on Friday. The exhibition will be exclusively reserved for women on Wednesday from 12 pm to 4 pm.